The Unitit States Marine Corps (USMC) is a branch o the Unitit States Airmed Forces responsible for providin pouer projection frae the sea, uisin the mobility o the Unitit States Navy tae rapidly deliver combined-arms task forces. It is ane o seiven uniformed services o the Unitit States. 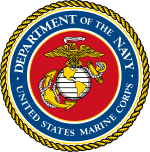 Creatit in 1775, the Marine Corps haes been a component o the Unitit States Depairtment o the Navy syne 1834, eften wirkin closely witnaval forces for trainin, transportation, an logistics. ↑ "USMC 3-star to retired CNO: 'Where's the beef?'" (PDF). Marine Times. Feb 2013. Retrieved 28 February 2013. ↑ Lejeune, Major General John A (18 April 1925). "Marine Corps Order No. 4 (Series 1925)". Commandant of the Marine Corps. United States Marine Corps History Division. Retrieved 2 February 2010. ↑ Loredo-Agostini, Sgt Heidi E. (30 July 2009). "Ready for the Corps: Marines recruit latest mascot from South Texas". Recruiting Station San Antonio. Castroville, Texas: United States Marine Corps. Retrieved 22 December 2010. ↑ Dobbs, LCpl Chris (25 July 2008). "Marine Barracks' mascot, Chesty the XII, retires after more than 40 'dog years' of faithful service". Marine Barracks, Washington, D.C.: United States Marine Corps. Retrieved 22 December 2010. ↑ "The Latest: Senate confirms Mattis for defense secretary". Washington Post. Associated Press. January 20, 2017. Retrieved 2017-01-20. ↑ Gen. Charles C. Krulak (1996). "Operational Maneuver from the Sea" (PDF). Headquarters Marine Corps. ↑ "U.S. Navy Organization: An Overview". United States Navy. Retrieved 3 August 2008. ↑ "National Security Act of 1947, SEC. 206. (a) (50 U.S.C. 409(b))" (PDF). Retrieved 13 December 2010. ↑ "National Security Act of 1947, SEC. 606. (50 U.S.C. 426)" (PDF). Retrieved 13 December 2010.